Minister of Forests, Lands and Natural Resource Operations Steve Thomson congratulated the winners of two scholarships from Vancouver Island University’s Heavy Equipment Operator Program at the TLA’s 74th Annual Convention & Trade Show, “In It For The Long Run. 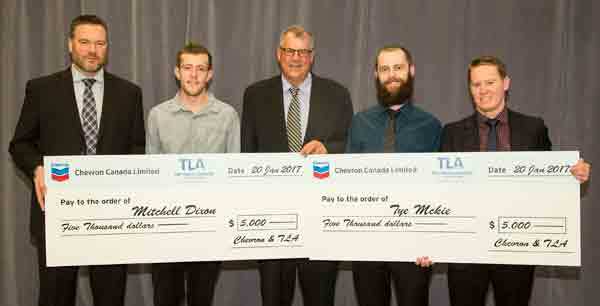 The two $5,000 scholarships, created three years ago, are jointly funded by The Truck Loggers Association (TLA) and Chevron Canada. “Education and skills training in the trades is critical to the future success of the forest industry, and the overall economic prosperity of British Columbia. It is a privilege to award these two VIU student scholarships alongside the Minister,” said Adrien Byrne, Chevron Spokesperson.